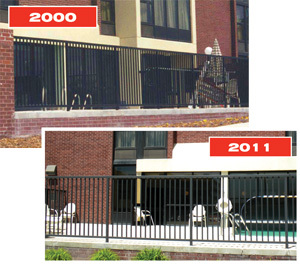 In 2000, a Drury Inn Hotel located in Englewood, Colorado, established a new look for its fencing and exterior railings that saved on maintenance and replacement costs. The fencing is still as strong and attractive eleven years later. The hotel chain selected fiberglass for its lower installed costs, low maintenance, and ease of assembly. The fiberglass fencing was made from 2″ and 1-3/4″ EXTREN® square tubing, custom pultruded in black and fabricated to look like wrought iron. FRP fencing makes sense as a long-lasting alternative to iron or steel because it is corrosion resistant. Steel handrail at the Drury Inn has to be painted regularly. Neither the FRP perimeter fence nor the FRP fence around the pool area has had to be repainted. The new FRP fabricated fencing and railing is now standard for all new Drury Inn construction and for any renovations. It is used for perimeter fencing and exterior railings for balconies, stairs, and pools. The FRP fencing has proven to be durable and maintenance-free — extremely important for Drury Inns which has more than 200 properties throughout the Midwest.